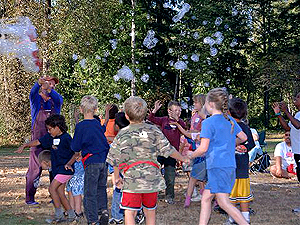 The 5th Annual FASD Family Summer Camp will take place Wednesday August 22 through Sunday August 26, 2007 at Camp Volasuca in Sultan, Washington (just 40 miles northeast of Seattle). The camp will feature activities for children and adolescents with FASD, their parents, and even their siblings, so remember to bring the whole family. Parent training activities will be offered by the FAS DPN staff and others. Camp lodging, meals, and activities are included. This includes meals and snacks from Wednesday through Sunday lunch. Camp accommodations include tent cabins with bunk beds, bathroom and shower facilities, a swimming pool, trampoline, miniature golf course, playfield, and many other camp amenities. If your family would like to participate, please fill out the registration form and have it mailed in by June 1st along with a $350.00 registration fee made out to NOFAS Washington. This registration fee insures your spot for your entire family. If you have any questions or concerns about the fee please contact us for scholarship information. Spots will be filled on a first come first serve basis and the camp is limited to 100 participants (about 20 families), so don't wait! We will send a follow-up letter by July 1st to confirm your participation and provide you with more information about what to bring, directions, agenda, etc.